How excited are you now that you finally have your own Traeger Grill? Yes, we know a shiny new Traeger Grill is a beautiful sight. But, we're guessing you are just itching to dirty it up a little and use it. And we have the perfect recipe for you try first. Beer can chicken provides the most delectable taste and when everyone sees it, no one will ever guess you're a newbie on the grill. This ingredient list is short and sweet. Be sure to gather the ingredients ahead of time to be sure you're ready to go at grilling time. 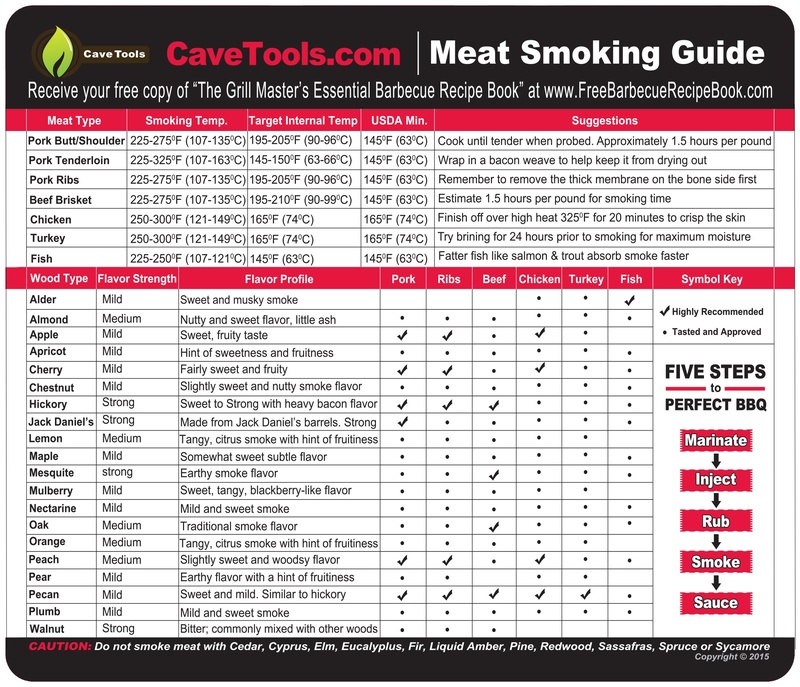 ​Pro Tip: When you are shopping for Traeger wood pellets, we recommend Mesquite pellets for this recipe, which gives you a strong smoky flavor. However, most pellets complement chicken. Alder and Apple are good alternatives if you are looking for something a little milder, that isn't too strong to overwhelm the chicken's flavor. Cherry and pecan are good if you're looking for a more flavorful option. Start by preparing your chicken, even before preparing your grill. 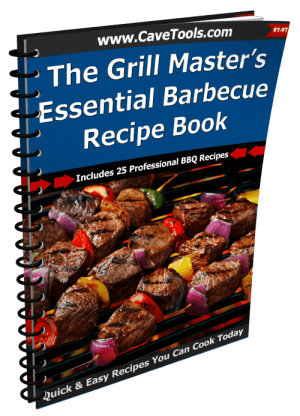 You want everything ready before you even turn your grill on. To prepare your chicken, you'll want to tuck the wing tips back, as well as truss the chicken legs together. To truss a chicken, means you need to tie it with butcher's twine to make it easier to work with. For the next step, you'll want to generously season your chicken with Traeger Chicken Rub, inside and out. 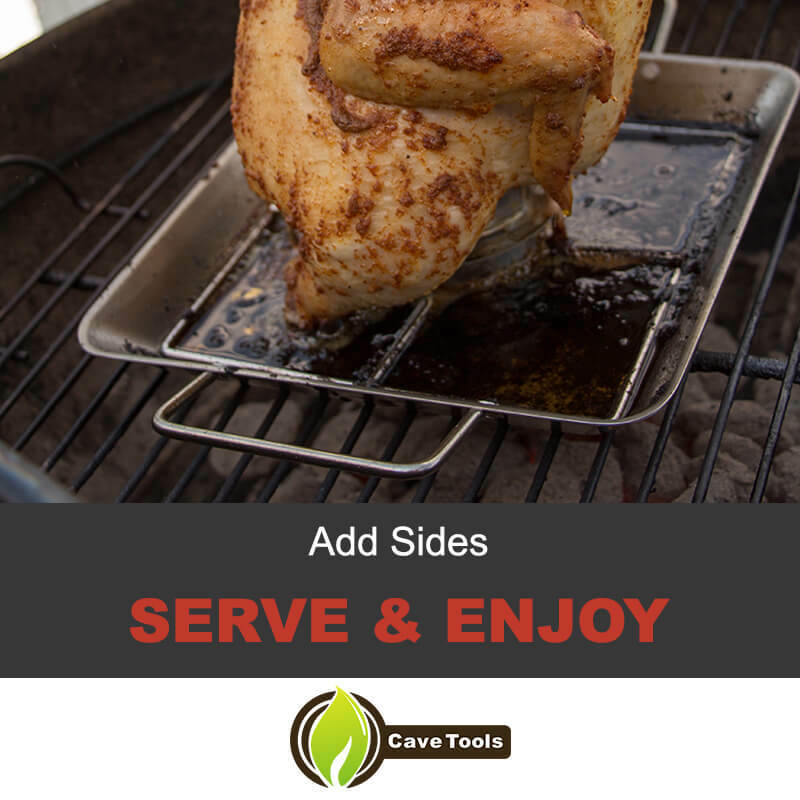 The Chicken Rub combines citrus and black pepper flavors to really bring out the flavor of your chicken. It comes in a shaker so it can easily be sprinkled on your meat. Next, you'll want to add the beer to your chicken. Open your can of beer and place it inside the chicken (still in the can), by sliding the chicken down on top of the open can. Only 1.5 inches of the bottom of the can should remain protruding from the chicken. Note: The type of beer you use depends strictly on your tastes. Some recommend a sweet stout for a sweeter chicken or a citrus option for a citrus flavor. 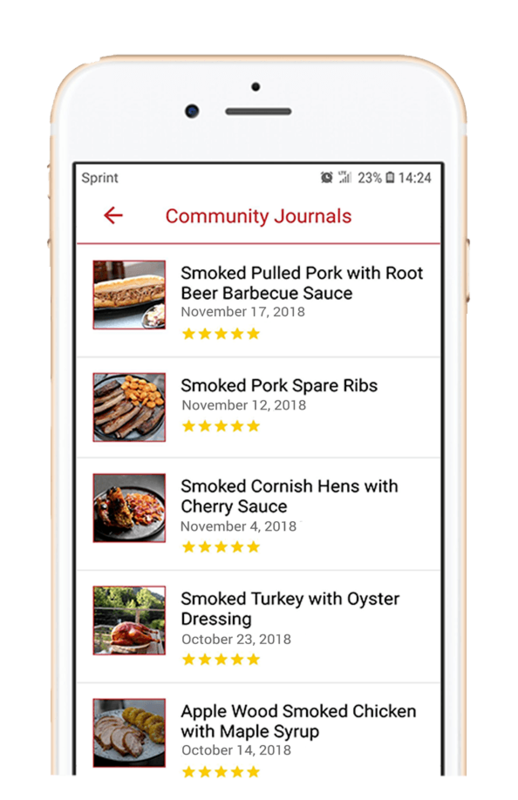 Most traditional recipes call for a domestic option. Of course, you don't have to use beer at all. You can use an empty can or small mason jar and add chicken broth, apple juice, lemon juice, or even wine. The possibilities are endless. Once your chicken is fully prepared, then you can start to preheat your Traeger Grill. If you haven't done so already, make sure your grill is clean and ready to use. Preheat the temperature to 350 degrees Fahrenheit and keep the lid closed for ten to fifteen minutes. Place the chicken on a baking sheet with the can still upright, and the chicken as well, and then put the sheet directly onto the grill gate. It should cook for 60 to 75 minutes. The internal temperature should reach 165 degrees Fahrenheit in the thickest part of your chicken. Pro Tip: The skin should crisp up nicely and the juices should be running clear before it's ready to remove. Carefully remove your chicken from the grill. Allow it to cool for five to ten minutes before attempting to do anything with it since it's so hot. It's best to place it on a cutting board to cool. You can move it onto the cutting board with a pair on tongs. Be sure to keep a spatula underneath it to avoid the can from slipping out. Once the time has passed, you can carefully remove the beer can from the chicken. (Don't wait too long because you want your chicken to stay warm enough to eat.) Caution: the can will still be extremely hot. Also, you want to be careful not to spill hot beer all over your dinner or yourself. Pro Tip: Place the cutting board next to your sink. Then, grasp your chicken with your tongs again. Next, you can partially (and very carefully) slide your chicken off the edge of the cutting board and over the sink's edge. Grasp your chicken with a fork and use the tongs to easily remove the beer can, allowing it to drop into the sink. Don't forget to also remove the butcher's twine from the chicken before cutting it. Just with the chicken, sides depend on you and your preferences. Be sure to check out the Traeger vegetable recipes to see a plethora of delicious options. Be sure to carefully time your preparations so that everything can be enjoyed hot off the grill. If necessary, prepare your sides ahead of time and have them ready to heat on the grill before dinnertime. 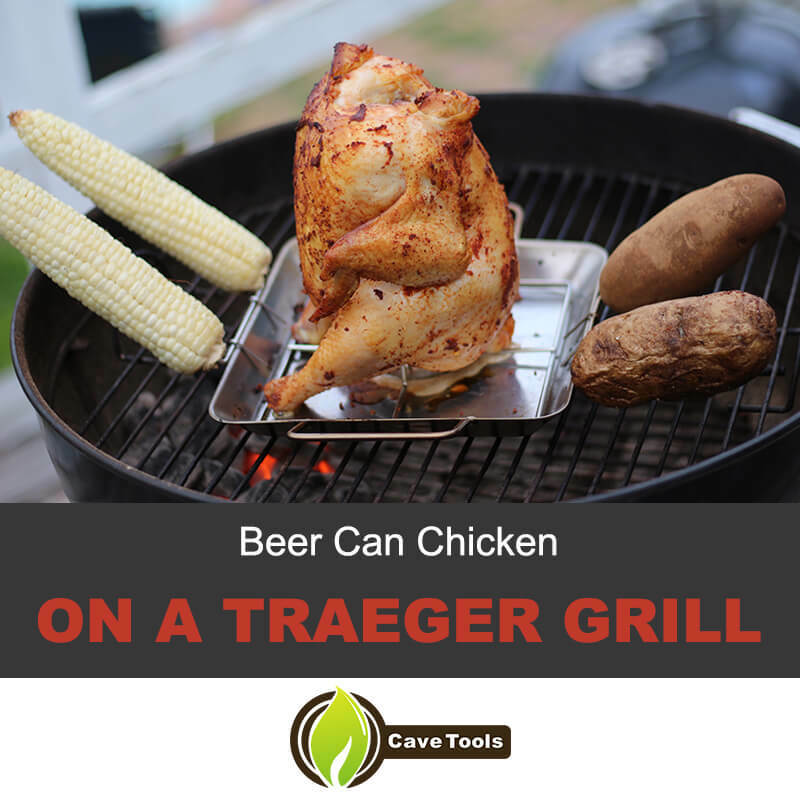 Check out this article for even more inspiration on how to make a beer can chcken! 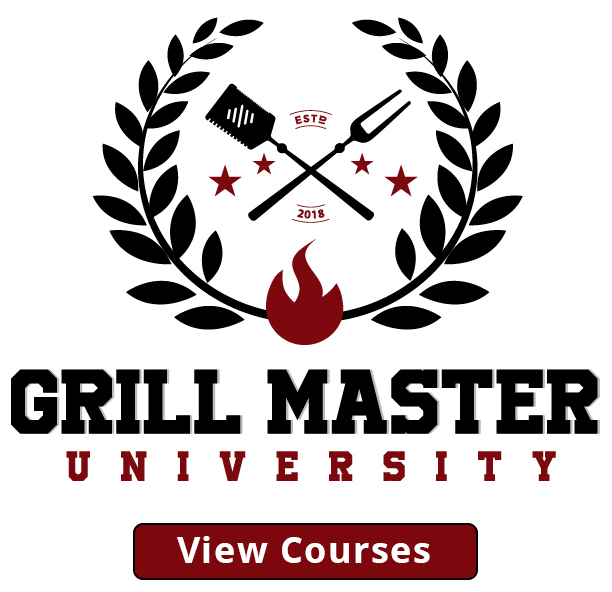 Ready to impress everyone with your grilling skills but you aren't quite sure yet how to grill anything? 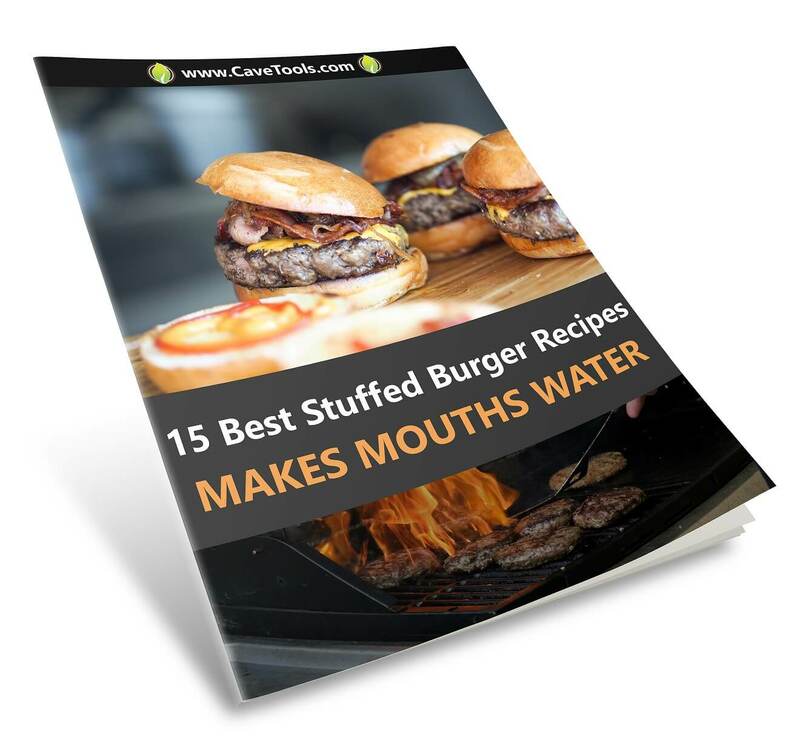 Hopefully you found this easy recipe useful and you get a chance to try it out soon. What do you think? Look like something you can master? Let us know in the comments! And don't forget to check back in once you've tried it out! What kind of beer is best for beer can chicken? This answer mostly depends on your tastes. You can use any beer you like, although we’d generally recommend avoiding IPAs and hoppy pale ales, as the hops can impart a bitter flavor to your chicken. Start with mild beers like lagers or pilsners and move on to heavier beers, like porters and stouts. If you don’t drink beer, you can fill a beer (or soda) can with any liquid you like - broth, apple juice, or even plain water. What temperature should the grill be for beer can chicken? You want to cook your beer can chicken slowly or the outside will burn before the inside cooks all the way through. 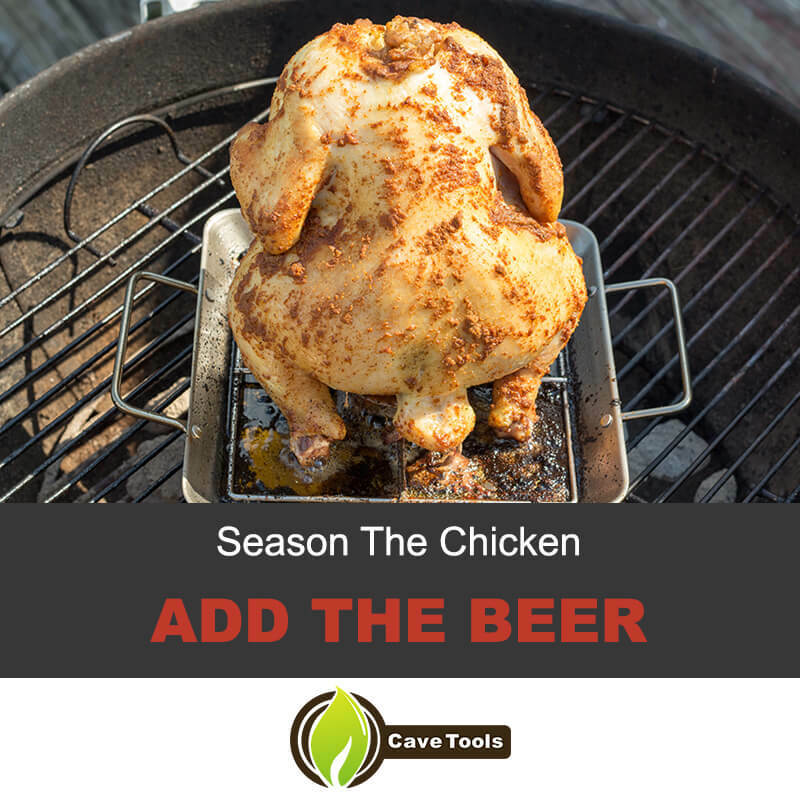 The best grill temperature is between 300 to 350 degrees F, which will take anywhere from one to two hours to fully cook your chicken to an internal temperature of 165 degrees F.
Where do you check the temperature on a beer can chicken? 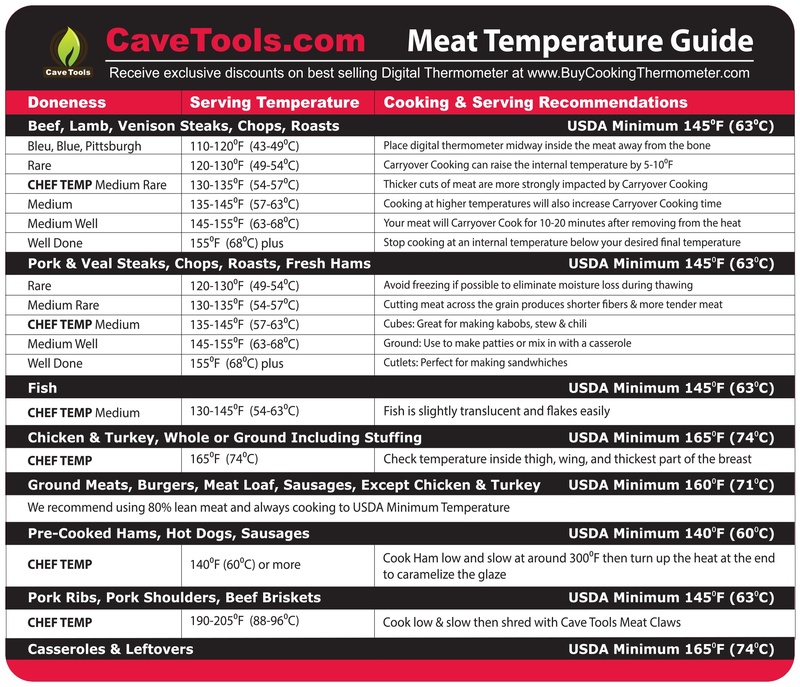 Using a digital meat thermometer, carefully check the temperature in the thickest part of the chicken breast to see if it has reached 165 degrees F. Be careful not to go too far and touch the bone, which will be hotter than the meat. Alternatively, you can check the chicken temperature in the thickest part of the thigh, where it should read 175 degrees F.
How do you remove the beer can after cooking beer can chicken? You’ll want to wait a few minutes so the chicken cools slightly before removing the can. The can will still be extremely hot, as will the liquid inside the can. We like to set the chicken inside a clean sink, or right next to it. Then, using tongs to grab the chicken, pull the chicken upwards. You can use oven mitts or a second set of tongs to hold and remove the can. What does the beer do in beer can chicken? It actually doesn’t need to be beer in that can - any liquid will do! The purpose of the can is to steam the chicken from the inside out. That results in crispy skin and perfectly juicy, moist chicken meat.